Last year I picked up a loose T30 system with charger(s) in a bundle of various other electronics. I was told by the seller the laptop was "non-functioning" which I was ok with. Specifically, the issue was there was a fan error causing the system to halt booting into an operating system. I tested it out shortly after acquiring and sure enough it would not boot and gave this error. Going from memory a case fan replacement isn't a difficult task as I understood and decided to shelve the T30 until I was more inclined to repair or find a new fan. Fast forward to 2 weeks ago and I remembered the T30 was lying around collecting a lot of dust. On a whim I boot it up and to my surprise it did not display the fan error and carried on from an XP install the previous owner was in the middle of. I promptly cancelled that, started a fresh install upon format and now have XP up and running. Of course, the question is for how long as obviously the fan error will rear it's ugly head again and perhaps I have been lucky but thus far in times running it I've encountered no issues or locking up. - one thing I noticed of some concern was the issue with the cracking of the RAM sockets solder on T30s. I haven't opened the system up and as mentioned nothing has been of issue yet so I suspect there are no troubles there yet. - best RAM upgrade option (can provide more info on request) as I'm presently running 512mb out of the gate. - I'd also like to know what carry case is suitable for the T30 and it's equipment - this presently regarding storage is my main concern. Anyway, any advice on T30s would be greatly appreciated even if it's an old model. Last edited by limbrooke on Sat Mar 04, 2017 7:28 pm, edited 1 time in total. Gone but not forgotten: T30 2366-86U 2013-2017; 600D 2001-20?? Get 2 x 1GB PC2700 (or PC3200) Sodimm. Try our Marketplace forum. Be careful to always carry it with two hands, NEVER with one hand on a corner! I have owned my fair share of T30's. All of mine had shimmed memory modules, in an attempted to prolong the known issue with 1 module disconnecting and no longer working. The shim is not terribly original, basically I have used the soft Styrofoam material that electronics come shipped with. It does not take much pressure pushing against the outer edge of the module to make it work. This is not ideal, but I dont have issues with the modules either. That said, dont cover everything, it might over heat. Use good modules, because they are going to run hot. RealBlackStuff wrote: Get 2 x 1GB PC2700 (or PC3200) Sodimm. Try our Marketplace forum. Why the higher PC2700? Isn't the T30 only capable of utilizing PC2100 meaning anything beyond that is wasted? Having asked that, what brand or manufacture of RAM is recommended or preferred? - PC2100 is typically more expensive and/or rarer than the slightly newer PC2700 and PC3200, given the same module sizes. - Running a module that meets the faster PC2700 and PC3200 standards at a slower rate means you will not be stressing the memory to its limit; access time of the memory being one of the more important specs, along with the probability of using less power. This leads to reduced chances of random read failures and a cooler running system. In regards to manufacturer, stick with any of the major DRAM players of the day (Micron, Crucial, Mitsubishi, Samsung [full disclosure: I work for Samsung but not in the DRAM division], Hynix, Hitachi, Mosel Vitelic (I used to work for them), Siemens/Infineon/ProMOS/Qimonda) and you should be okay. Value-line/consumer module assemblers such as A-Data, Viking, PNY, Kingston, Corsair, Kingmax will typically use major manufacturer DRAM chips but may or may not do an effective job in designing and/or testing the modules. You could go with assemblers favored by overclockers such as G.Skill but in my mind you pay a premium for them. Whatever/whomever you choose, make sure that you buy from a seller that offers returns and thoroughly test the memory using something like memtest86+ for several hours. 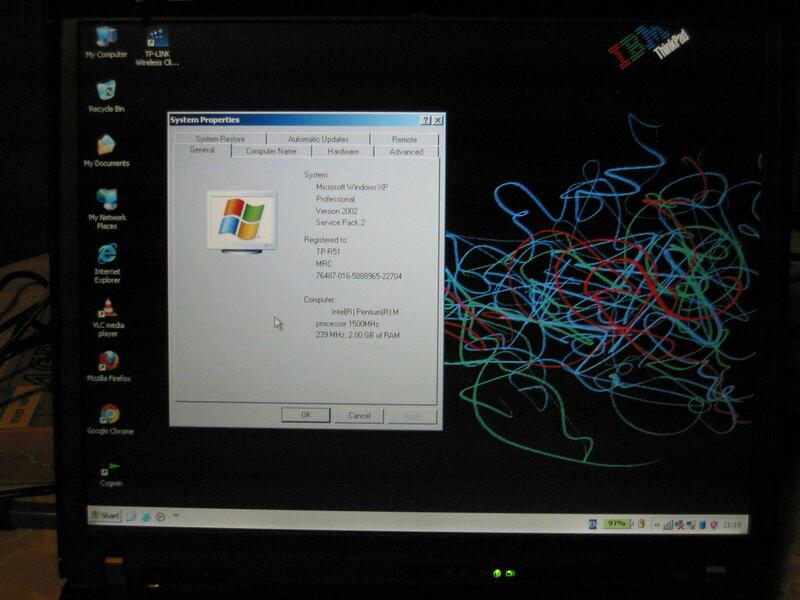 My T30 running well with 2 pieces 1 Gb ram PC 2700.
priono2000 wrote: My T30 running well with 2 pieces 1 Gb ram PC 2700. I agree, my 1.3GHz/2GB RAM T40 from March 2003 runs XP flawlessly. A true testament to the T Series ThinkPads superb build quality and longevity over a decade later. Mine still looks like new. For what you pay new, it better. I use it daily for management courses in college; and for personal entertainment it streams Netflix flawlessly. I think a big plus about the ThinkPads is the dedicated video RAM. last week, i install win 7 ultimate on my T30. After install my T30 seem very smooth running and better than win XP. There is some driver can not install such as display driver for Radeon 7500 and wifi. Can any one help to fins this driver? After stumbling across a T20 video on youtube I dug out my under used T30 which I've still not replaced the fan on. I check now and it seems the fan replacement was simpler than I originally recall - I must have looked up a different model because it didn't look anything like the all-in-one metal housing I recently saw on ebay. All the same, I'm going to take the old fan out try cleaning and running diagnostics. If all goes well so be it, otherwise I'll scoop a replacement up and install that and proceed forward in obtaining the necessary ram to make everything running properly. I also see some replacement batteries have gone down in price too so I might as well get a new one of those given my current incarnation is depleted fully. I received a new 5.2aH battery from screenaid recently and so far it holds a good charge. I may consider having the original battery refurbished down the line but for now having some mobility without the charger is nice. In brief use its clear I need extra RAM now so I've ordered some Crucial PC2700 2x1gb modules which I should have shortly. In checking inside the previous owner had 1x IBM (ProMOS) 256mb PC2700 running with a Samsung 256mb PC2100S (which has an IBM FRU). Even for normal web browsing via Chrome 512mb (although ultimately I understand upgrading the RAM won't change much) is not quite adequate so it had to be done. I suppose I'll seek out a Mini PCI b/g adapter, although n would be good too. I'll look into the NO-1802 hack application shortly. limbrooke wrote: I suppose I'll seek out a Mini PCI b/g adapter, although n would be good too. I'll look into the NO-1802 hack application shortly. Consider a low-profile usb wifi, with n if you want. My basis for saying this is that I've been using my (new) x22 and the Mini PCI b/g card isn't able to connect to the two networks I've tested. It sees the networks but won't connect. Perhaps it's a fluke, who knows. The usb wifi works great. Since that wireless n adapter from TP-Link is now hard to find that new slim adapter they offer may be a good alternative. There are no bottlenecking issues when using with the USB 1.1 ports on the rear? 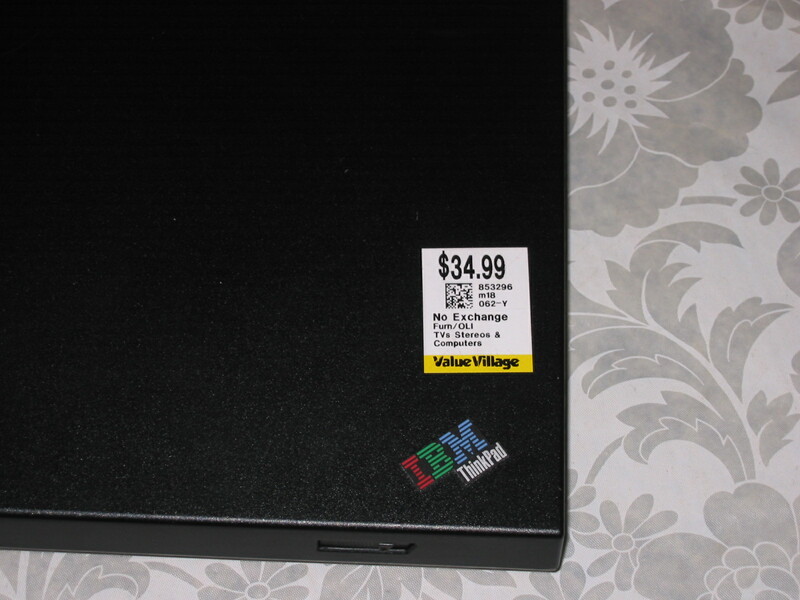 If not, that's good, although I would considering the USB 2.0 PCMCIA adapter anyway so I could always put it on that. With my T40 and W7, I solved all the problems (including that for the Radeon driver) except for wifi. I used one of those mini USB wifi gizmos that I found on Amazon. Cost me all of about $15. Since that wireless n adapter from TP-Link is now hard to find that new slim adapter they offer may be a good alternative. TP Link adapter is worth spending some extra time/money to find it. It works wonders on these old ThinkPads. There are no bottlenecking issues when using with the USB 1.1 ports on the rear? Plenty thereof, actually, to the point of the machine freezing solid. Don't follow this path. You're better off picking a b/g or a/b/g mini-PCI card even if you get stuck with 54Mbps rates, at least it will be reliable at those speeds. Will test with an a/b/g adapter. fwiw, here are wifi test results done on my X22. With the usb card the machine was crashing. I haven't tested enough to know whether the machine will crash with the other two cards. I finally got my TP Link TL-WN861N abgn card installed and working properly (with the no-1802 fix). I need to set my work wifi access up tomorrow but otherwise its looking like it will get more use now. I've since gotten the new RAM and performance has improved (512mb to 2gb). General web-browsing and even video streaming is manageable now so its a recommended upgrade. As well, I got a new 80gb 7200rpm 2.5" drive - in the Windows event viewer I keep getting disk warning flags and I believe during boot up some warnings there as well (intermittently). I figure its a good idea to replace the drive anyway as its often busy/chattering even with little data, fragmentation, or operations present. I also may want to get a new fan since I still get the old FAN ERROR at the start (not often) along with suitable thermal paste (I've really put this off for a long time but I've used the system sparingly until now). I noticed a new issue wherein when going to standby the system half wakes up. The crescent moon from sleep switches over to battery and I can even turn on the keyboard light but nothing is on screen and I'm forced to hard shut down and reboot. I've briefly read it may be due to a capacitor needing discharge or even cooling the unit down in a freezer/fridge. Could it be I may need a new CMOS battery or even a BIOS update? I will add that even in Windows Power Options the system won't hibernate even if that parameter is set. Before you replace the CMOS battery, make ABSOLUTELY sure that you have NO passwords in your BIOS (and/or HD). Take the finger out and clean up/replace the thermal paste between CPU and cooler with the likes of Thermal Grizzly Hydronaut or Kryonaut. Overheating can occur in seconds! Personally I never put those machines to sleep (except when I round-bin them), waste of time and battery-life. After one trip to the lab/office and the memory is starting to disappear. The old cracked solder joints I suspect - truth be told this probably would have happened anyway as T30s are prone to this issue but it is noteworthy that I did walk over a couple kilometres while carrying it in a laptop bag. It seems after a reboot the memory shows up in full again but on most cold boots only 1/2 appears initially. If I had the ability I'd like to reflow the pins but I'd rather not do damage beyond the current state. Its been a long and somewhat uneventful road with the T30 and despite the minimal use its gotten I feel that it might be a good idea to move on. limbrooke wrote: If I had the ability I'd like to reflow the pins but I'd rather not do damage beyond the current state. Its been a long and somewhat uneventful road with the T30 and despite the minimal use its gotten I feel that it might be a good idea to move on. anything from a t40 to a t400 can be got cheap these days. Dekks wrote: anything from a t40 to a t400 can be got cheap these days. I pretty much ignore frankenpads as they're pretty much US only. FWIW T43p can be had on ebay.co.uk for £45 quid for the 1600x1200 IPS screen in top nick, i've seen other regular T43p go for £30. T42p even cheaper as while IPS models are rare there is little demand for anything not dual core. It's the same 4 or 5 bidders on any IPS model be it T4X or T6X. Sellers must be more ambitious in my country. People on US ebay think they can sell T42p and T43p for close to $100 or more.... and sometimes they do. They're probably mint or units with underused screens. I doubt I could sell any of mine - complete with lightning bugs, if I'm lucky maybe I can get $50 for my R50p on craigslist (it's my baby and I'll never sell it). TPFanatic wrote: Sellers must be more ambitious in my country. People on US ebay think they can sell T42p and T43p for close to $100 or more.... and sometimes they do. They're probably mint or units with underused screens. I doubt I could sell any of mine - complete with lightning bugs, if I'm lucky maybe I can get $50 for my R50p on craigslist (it's my baby and I'll never sell it). IPS units are rarer here in EU so 99% of the sellers have no idea what it is, plus as i said demand is low. If I could find one locally for a low price, I probably would. As it stands I was lined up for a T60 but plans changed and got a desktop instead. I'd probably see if the RAM pins could be re-flowed locally but in my reading its a temporary fix and I'd like more long term stability for the cost - in theory the service charge for that repair could be doubled and I'd have a whole replacement, newer Thinkpad. I live in Toronto Ontario and have a A31p in spare. Grabbed 2 working A3x batteries from Canada Computers. One in my A30p and one in that. Where in Ontario do you live in? Officially, I've gotten rid of the T30, via ebay no less with all the issues listed accordingly. I figured it was too much trouble to restore given the RAM issue that recently showed up and as it stands I happened to luck out shortly thereafter. I saw this in a local Value Village showcase and was allowed to test it. Unit had been digitally scrubed so no OS present but it was very clean (cosmetically) and running quiet. For $40 I decided to roll the dice and see what happens and turns out this R51 was a winner. I was able to make use of the previously bought T30 ram (Crucial PC2700 1gbX2) since this R51 can take up-to PC2700 speed (vs PC2100 on the T30). While the R51 came with an Intel 2200BG Mini-PCI card I decided to swap that as well. I installed a clean XP SP2 build and learned while my home wireless network connected fine my lab one did one, not with Windows Zero Configuration, even with the WPA2 service update. Rather than go to SP3 I put in the TP Link WN861N AGBN card and thanks to the profile configuration files was able to easily connect home & out. Battery holds an alright charge (over an hour) and it came with a charger. No UltraBay compatibility between my T30 peripherals but thats hardly an issue. I will be able to use that 80gb 7200rpm drive in this when I have time to make a drive image and swap it out. Despite the 1.5ghz vs 2.0ghz cpu difference I feel the speed is adequate and at times even better performance than the T30 afforded me at the best of times. I do prefer the build quality of the T30 (the nice matte finish case), the screen (brighter/clearer), the keyboard light (white vs R51 orange), and the lid clasps (2 on the T30 vs 1for2 on the R51). Accessing the RAM and Mini-PCI slots are inconvenient for access but its not a common task and honestly not that bad. There is one feature I'll miss, the form factor; the T30 at least fit in my carry bag without issue while the R51 is +2cm wider along the keyboard width. Having said that I'll probably like to get a suitable match for the bag, perhaps something from the T4X line (T43 perhaps) since they seem to be about the same size/footprint. With that I bow out of this sub forum and thank for the assistance I received. I'll be sticking around however for further advice on the R series and perhaps others when I find them.